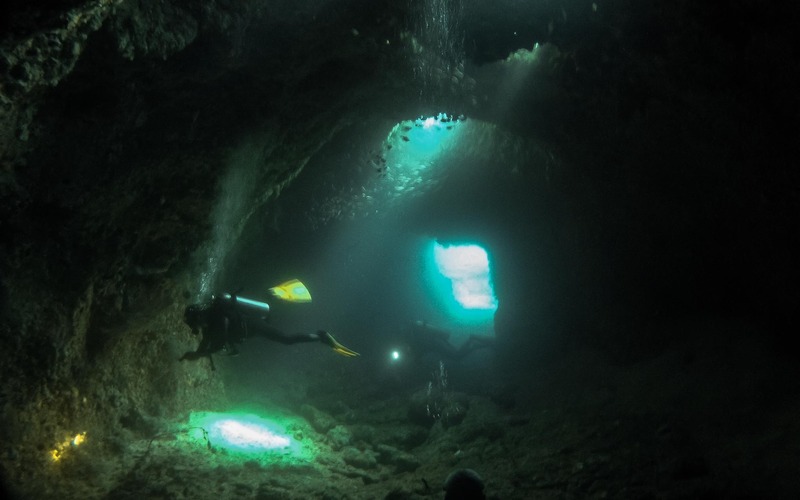 If you explore the North face of Helicopter island, along the cliffs of limestone, at about 10m deep, you will find the entrance of one the most famous and incredible dive sites of the Bacuit Bay: The tunnel of Dilumacad. Dilumacad is the Tagalog name (Filipino) of Helicopter island. Dilumacad means "does not move". It is for instance a reference to the fishermen of Bacuit Bay who were using unmotorised traditional boats a long time ago. On their way back to El Nido village after their duty, they found the time very long on their boat, having the feeling that Dilumacad island was neither going closer nor going further away. The modern name of Helicopter comes from the shape of the island that looks like an helicopter from a certain point of view. You need to have a bit of imagination indeed. The tunnel of Dilumacad is horizontal, totally natural, and measures 35 meters long. A memorial stone was taken next to it, at the year of its discovery. The entrance and exit are between 9 and 11 meters under the surface, depending on the tides. The entrance and the exit are quite narrow: about 2 meters wide and height, large enough to get into it with no difficulties. Turn on your flash light, keep your eyes opened, and come inside one after another. Rocky on the sides, many small holes in the walls, perfect for some critters to hide: pipefish, shrimps, crabs or other crustaceans. The bottom is sandy, but it is not a reason to touch it. If you look from close enough, you can see many tiny transparent shrimps. While you are there, observe as well the colourful sea slugs "nudibranch", and probably a lionfish swimming around in the darkness. Control your buoyancy at all time, move smoothly and slowly, and stay far enough from each other. In the middle of the tunnel, you can find an impressive chamber. Go all around, look for the spider-crabs, the morays, the spiny lobsters hiding from you inside the walls. A bit further away are three holes allowing the sunshine to come inside, lightning a school of sweepers dancing in the light. Next to it, there is an Electric fire clam (or Electric flame scallop) ; the clam has a highly reflective tissue on the very outer edge of its mantle that is exposed and then hidden very quickly, so the change back and forth from the white reflective tissue to the red tissue creates the appearance of flashing. It is kind of incredible! There are 3 electric clams inside the tunnel, are you going to find them all? Then, look for a scorpionfish, a hermit crab, an angelfish, a pufferfish. It is not so rare to find some in the area. Also, seek the octopus or frogfish, it is likely to see one in the corner of a rock formation. The experience of diving in the tunnel of Dilumacad is magic. 100% of the people who dove there loved it. It is a particular dive site, so different from the other usual reefs from the Bacuit Bay. Its critters remind the one you see during night dives. The site is easy to explore if you are comfortable and if you follow the safety rules. In El Dive centre, divemasters and PADI instructors suggest it to people who have the Advanced Open Water level (or equivalent - or higher), who control well their buoyancy, and who feel like they want to do it. If you don't have the required level, ask the instructors of El Dive, they can arrange a PADI course including it. The briefing made by your divemaster or instructor is as important as the safety is important in a site like this. Listen carefully and don't hesitate to ask questions. How do you communicate, what can you expect, what kind of difficulties can you meet in an underwater tunnel, what bottom time, what safety margin, what buddies, etc. The North of Helicopter is at the very edge of Bacuit Bay, the place can be exposed to the sea conditions. That's why if the waves are too large, or if the general weather conditions are not in favour, the comfort and the safety can be compromised ; on board, as well as inside the underwater tunnel. If your divemaster estimates it is necessary, he will change the plan and orientate you to another dive site.